July 29th in Ha - SolarChat! This past session took much longer to process than I expected, but I finally finished up and have my images from last Sunday (July29th) presented below. Crystal clear skies all day and relative good seeing that lasted until the noon hour helped to make the session run nicely. The usual setups were used...LS80T/LS75FHA/B1200Ha DS solar scope for full disk and the modded CR150/DSII/B1800Ha scope for the higher resolution images. 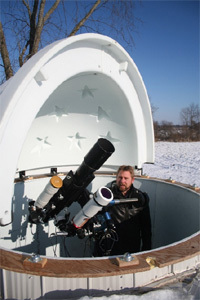 The PGR Grasshopper Express (ICX674 chip) was used to capture the full disk images and a ZWO174MM was used on the higher resolution images. A great collection Brian, the Sun was very hairy I think the prom pictures are the best enjoy your holiday weekend! A lovely set of images there Brian. I truly enjoyed my visit to Canada, what a great country: it was nice touching base with you. Franco, good to hear you enjoyed your visit to Montreal and a pleasant surprise when you called too. Your timing was good as about a half hour later I would have been out in the field harvesting wheat plots and wouldn't have heard the phone over the equipment. Alexandra, thanks I hope we can get some repairs made over the long weekend...the pool deck needs some major attention. Hope the fog burns off and I can catch some sun too.